The average reasonable person almost automatically assumes that he or she has an open mind and does not entertain prejudices against any particular class or group of people. Nevertheless, if you ask members of the general public if they would be willing to vote for an openly gay candidate the general consensus response would be “Not in a million years.” I now have an opportunity to reflect on that issue. Paul Babeu is a man of impeccable character who has offered his life on a daily basis both in military service and later as a law enforcement officer who eventually was elected Sheriff. Mind you; many elected sheriffs sit in their cozy little offices and allow their underlings to do the work. That is not the case for Mr. Babeu. He is on the front line every day protecting U.S. citizens from every facet of crime. We are all truly privileged and blessed to have this man in office. Let me pose a hypothetical: what if you are in desperate need of heart surgery? What if you are a hopeless bigot who believes that homosexuals serve no purpose in America? What if you woke up from surgery and discovered that the only doctor in the world who could have performed that surgery successfully and actually did so is in fact gay? Would that change your mind? Prejudices are pre-conceived conclusions based on incomplete and biased data and information. Clearly the historical record of homosexuals in America and the world is hopelessly skewed to cause these prejudices. It is a tragic circumstance that those who do not share certain traits are grouped into the general category and assigned these blemishes. Sadly; the revelation of Mr. Babeu’s sexual orientation has caused a great throng of the public to effectively throw him under the bus based on a series of stereotypical conclusions that we tend to associate with gay individuals. As a heterosexual male, I am not able to view this factor from Sheriff Babeu’s perspective. I nevertheless know that this is a meaningless issue when compared to this man’s character and service to this nation and our community. Nobody is perfect; but Mr. Babeu is pretty damn close. 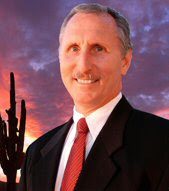 Whether Mr. Babeu is a better candidate than the incumbent Paul Gosar is not a question that I address. That is an issue that each eligible voter within the prospective precinct must determine to his/her satisfaction. The only thing that I ask is that this “issue” of sexual orientation is in fact a non-issue that will not have any effect upon a voter’s evaluation of the candidates. A truly objective voter will examine each candidate’s history of service to this nation and their public positions concerning each relevant issue: Education, Health-care, Immigration, Oil and Energy, and the nation’s economy. Only then can a voter make an intelligent decision. Wow! A million years passed by in the blink of an eye.